The Java codePointAt method is one of the Java String Method which is used to return the Unicode of the Character at specified index position. In this article we will show you, How to use codePointAt method in Java Programming language with example. TIP: The index position of the Java codePointAt Function will start from 0, Not 1. 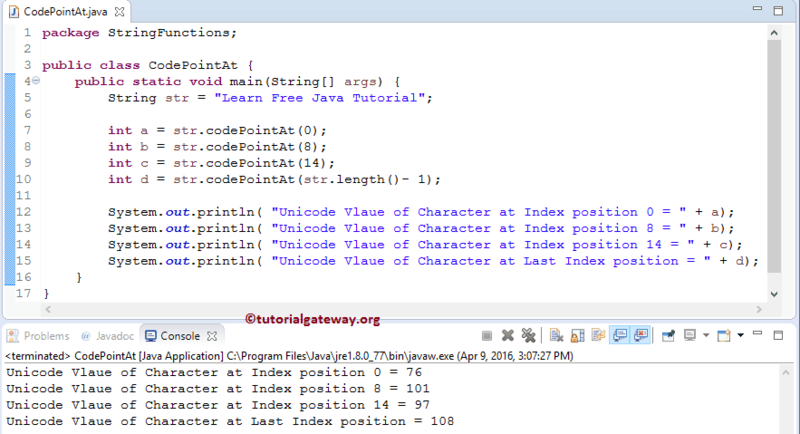 The basic syntax of the codePointAt in Java Programming language is as shown below. String_Object: Please specify the valid String Object. Index_Position: Please specify the index position of a desired character. TIP: Please refer ASCII Table to check the character codes of each and every character. The Java codePointAt Function will return the Unicode value of a Character from String_Object at specified Index_Position. If we specify the Index position out of range or negative value, then codePointAt Function will throw an error. The Java string codePointAt method is used to return the Unicode value of a Character at specified index position. In this Java program, We are going to find the same. The following statements will find the Character at index position 0, 8, 14 and then assign the Unicode values of those character to the integer variables a, b and c.
If you observe the above screenshot, str.codePointAt(0) is returning 76. This is because, we all know that character at index position 0 is L and according to ASCII Table, the Unicode value of L is 76. In the next line we are using the Java length() function to calculate the string length. From the above code snippet you can observe that, we are subtracting one from string length because, length of a string will count from 1 to n where as index position will start from 0 and end’s at n – 1.